Maven: best way of linking custom external JAR to my project? It's my first couple of days learning Maven and I'm still struggling with the basics. I have an external .jar file (not available in the public repos) that I need to reference in my project and I'm trying to figure out what my best option is. It's a small scale project without a central repository for libraries, so it has to be either a local repository (somehow added to source control, don't know if it's supposed to work that way?) or the .jar needs to be stored on disk outside of any formal repository. 1) What's my best option for adding the .jar file to my project's references with maven given that I want both the project and the library to be in source control? Should I be executing mvn install:install-file even thought I already have the pom.xml edited as above? I think you should use mvn install:install-file to populate your local repository with the library jars then you should change the scope from system to compile. If you are starting with maven I suggest to use maven directly not IDE plugins as it adds an extra layer of complexity. As for the error, do you put the required jars on your classpath? If you are using types from the library, you need to have access to it in the runtime as well. This has nothing to do with maven itself. I don't understand why you want to put the library to source control - it is for sources code not binary jars. This can be easily achieved by using the <scope> element nested inside <dependency> element. update We have since just installed our own Nexus server, much easier and cleaner. b. On your host create the folders to match this pattern. i.e if you have a jar file named service-sdk-0.0.1.jar, create the folder service-sdk/service-sdk/0.0.1/ and place the jar file service-sdk-0.0.1.jar into it. Use "mvn install:install-file" with -DlocalRepositoryPath. Configure a repository to point to that path in your POM. If you meet the same problem and you are using spring-boot v1.4+, you can do it in this way. There is an includeSystemScope that you can use to add system-scope dependencies to the jar. I'm using oracle driver into my project. See this question for how to install maven artifacts. enclosing tags. It's not clear from some of the examples. The best solution here is to install a repository: Nexus or Artifactory. If gives you a place to put things like this, and further it speeds things up by caching your stuff from the outside. If the thing you are dealing with is open source, you might also consider putting in into central. Maven will take them when installing the project. in the project directory. This will add the jar into .m2 directory which is local maven repository. Then you will have to add classes individually while using executing through command line. Not the answer you're looking for? Browse other questions tagged java maven-2 maven m2eclipse or ask your own question. Maven: How to include jars, which are not available in reps into a J2EE project? How to manually install an artifact in Maven 2? 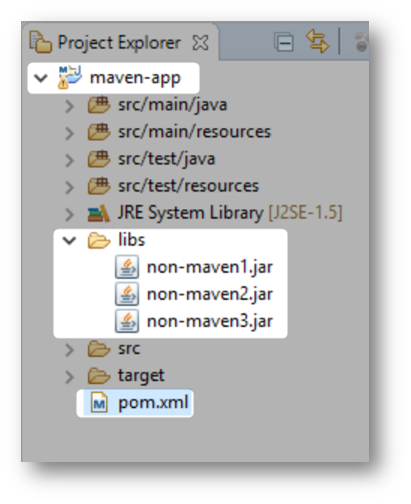 Maven and eclipse: a reliable way to add non-Maven or external jars to a project? How to add external jar (proprietary) in Spring Boot? How do I convert a exist Java project to maven project?